Since PWM, I’d gone back to fvwm2 and then back to icewm. Seemingly, that wasn’t quite enough hopping around, so I built the latest greatest gnome 2 preview using the GARNOME distribution, which is a pretty cool BSD ports-ish way of building gnome 2. Well, gnome 2 looks good but isn’t there quite yet. Soooooo, I thought that I should give KDE a try again, seeing that they’ve passed the 3.0 milestone. My oh my, it’s even prettier than 2.2 and the strange thing is that it’s quite a bit snappier as well! I have it running with Mosfet’s high performance liquid and it’s seriously drool-worthy. For a run-of-the-mill screenshot, click here. There are even debs for testing available (go to #debian-kde on openprojects.net to see where and how) so installing is a cinch. 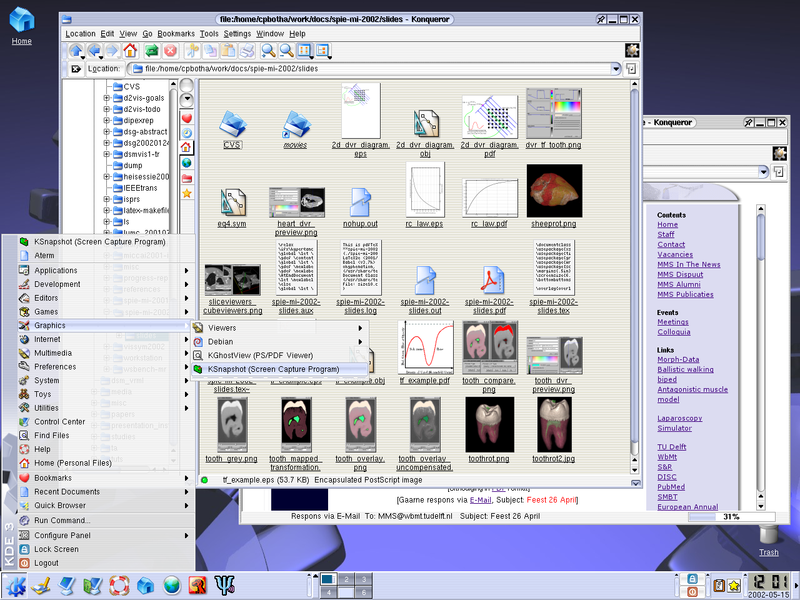 Well, I think I’ll play around on KDE3 for at the very least a day or two, until I go install The Next Desktop™. PS. Yes, actually I do get quite a lot of work done.